Know what’s great about La Sera? Just about everything. They’re a little rock ‘n’ roll, a little surf rock, a little post punk, a little garage pop, a little folksy and all the way awesome. And Music for Listening to Music To is a prime example of the surplus of songwriting talent and genre blurring finesse that makes Katy Goodman (ex Vivian Girls) and company fantastic. 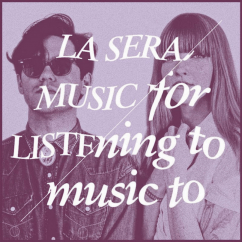 Despite the raw, rockin’ goodness of 2014’s Hour of the Dawn, Music for Listening to Music To, with it’s less urgent but more emotionally and musically resonant sound (partly down to producer Ryan Adams encouraging an analogue, live and in-studio approach to the record), may very well be La Sera’s best release to date. And considering it seems the band surpasses each of their records with the subsequent follow up, four albums in, this is still just the beginning. La Sera relied on crunchy distortion and rock ‘n’ roll compositions for Hour of the Dawn. It was a bit of a risk, a tad out of their wheelhouse, but it just worked so damn well. Goodman has never been one to rehash ideas, however, and began writing songs with her now husband Todd Wisenbaker and confidently moved away from that successfully rendered sound just two years after it was put on display. While Music for Listening to Music To may be a bit lighter on the guitars, it matches the craft quality note for note and lyric for lyric. In fact, the lack of crunch doesn’t in any way equal a lack of punch. These tunes, for their soft, subtle execution, are beautiful and poignant and rely on nothing but Goodman’s voice and Wisenbaker’s masterful guitar-work—along with his occasional vocal—to slather on some icing. From opening track “High Notes,” it’s clear La Sera is bringing some new tricks to the table. Upbeat and fun, this song’s beat and southern guitar sensibilities provide immediate smile fodder. 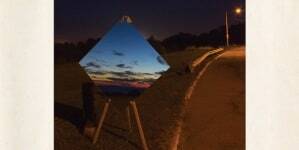 Goodman’s vocals, with all their subtle charm, add a proverbial cherry on top, too. This fantastic little frolic between country music and the Smiths may clock in at just over two minutes, but its title doesn’t lie. Right out of the gate, La Sera kicks Music to Listen to Music To off with a high note and just doesn’t let up. “A Thousand Ways” is reminiscent of an old dancehall shuffle from the ‘50s that could give George and Lorraine McFly something to groove to at the Enchantment Under the Sea Dance if only we had a tricked-out DeLorean. Flux Capacitor-less, however, this track is a gorgeous little throwback that works beautifully in the present, as many artists are delving further and further into the past for inspiration. For another example of this neo-dancehall-post punk, spin “Take My Heart” and grab your lady, your gentleman or anyone you damn well please, get close and get dancin’. “Begins to Rain” is a mid-tempo post punk jam replete with a country swagger and surf rock twang. A bit more melancholy than previous tracks, this is a heartbreaker set to a head-bopping beat. Leave it to Goodman and Wisenbaker to pull your heart out to a driving 4/4. “I Need an Angel” is a perfect companion piece to “Begins to Rain” but has an attitude that’s a bit more confident despite the Wisenbaker-centric chorus in which he sings, “Heaven help me/ I need an angel/ I need a miracle/ Cause’ I’ve tried all my luck in this world/ I would do anything for you to love me.” Think of this tune as the older, more mature, but angstier older sibling to “Begins to Rain.” Similarly, “Time to Go” matches speed with “High Notes” and inhabits the other side of the track’s coin. Intentionally or not, many of Music for Listening to Music To’s songs have mirror tunes that live in the same headspace as one another but show off a different side of La Sera’s talents. “Too Little Too Late” closes out the record with a soft and slow reflection on loss and pain. It’s got just the right amount of lyrical sadness and musical beauty. It would be as difficult to imagine another song in its place as it would be to shoehorn it somewhere else on the track list. It’s a quintessential ender. It’s the period that ends the sentence. Not too sad, not too upbeat, but just right. Picking up a follow-up to Hour of the Dawn brought with it more worry than excitement. But as soon as “High Notes” begins, the idea that Hour was the high note of La Sera’s career turned out to just be a silly notion. Music to Listen to Music To, in very, very different ways, has once again proven that La Sera is one of the most exciting indie rock bands out there that seems to be more a well-kept secret than the massive draw it should be. So do yourself a favor, get on the La Sera train now. We may not know what the hell they’ll come up with next, but if history means anything, it’ll only get better from here. And here is truly fantastic. There's a reason Jacklin named the album after the closing track. Moods Baby Moods is a bizarre album, and purposefully so. Little Windows Cut Right Through can almost be split in two. 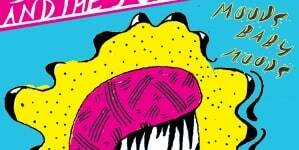 A positive album of power pop that occasionally verges on bubblegum. Pump up the energy at all costs and cut tracks down wherever possible.